Last week a few friends and I headed over to Colicchio&Sons for their inaugural Brewmaster Dinner of 2011, featuring Garrett Oliver and his Brooklyn Brewery beer pairings. Special diners like these can be hit and miss, and this one was a hit, a home run in fact. 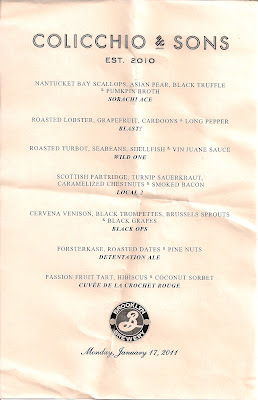 Considering the bargain price of $95 for 7 great courses each paired with a generous pour of some delicious difficult to impossible to get beers, I'd probably call it a grand slam. Garrett Oliver set the tone for the evening by playfully scolding the servers for neglecting to bring him a beer as he was standing at the end of our table giving an introductory speech (Apparently they always forget the speaker's pours.) Garrett Oliver proved most affable once again, just as he did when we chatted with him about brewing at last fall's Brewer's Bash at Eleven Madison Park. Next up was the lobster paired with Brooklyn's Blast! IPA. They don't make much Blast!, but unlike most of the upcoming beers, you can actually find it in a few places. The close to the brewery Brooklyn Bowl gets about half of it, check Beermenus for others. I often find lobster a bit boring, but this was among the better preparations I've had in a while. Its sweet meat was meltingly tender and the rich butter sauce played off the hoppy bitterness of the beer very well. It was hard to pick a favorite dish because they were all so good; most of them garnered a vote of favorite of the night from someone at the table. The Turbot was no exception. Moist flesh, crispy skin, and additional teture from the shellfish in the exquisite vin juane sauce were beautiful. The buttery sauce made from oxidized wine reminded me of Jean Georges' signature Turbot in Chateau Chalon Sauce, one of my favorite dishes of last year which I still dream about. Jean Georges' version is slightly better, but it lacks the crispy skin so C&S's this night could contend. Back to the near present. Paired with the turbot was Brooklyn Wild One (here's a rave review), which starts out life like the Belgian strong golden ale Brooklyn Local 1, but then is aged 9 months in Woodford Reserve barrels, and then undergoes bottle refermentation with Brettanomyces, aka Brett. This imparts a complexity and mellow tang to the beer and adornes it with layers of flavor. This is a special beer that you can not generally get except at special events; they just can't make enough of it. As Garrett Oliver told us, if you release such small production beers commercially, you make a lucky few people really happy, and a whole lot of people really mad. Man, this is going to be a long post, I'm only on course 4 of 7. Next was the partridge, paired with Brooklyn Local 2, a Belgian Strong Dark Ale made with local honey. It clocks in at 9% alcohol (most of the beers tonight were quite strong) and if I'm not mixing up my sparse notes with another course the beer we were served was aged for 2 years, which causes the bitter components to fade somewhat. The esters and high alcohol content also makes this beer taste sweet, even though the sugar content is very low. The alcohol also helped cut through some of the rich and gamey flavor in the components of this dish. The partridge was fork tender, and the bacon an explosion of smoke. None of the three final beer pairings are commercially available, for some of these Garrett Oliver dug into his personal stash to bust out for us. To go with the venison they poured Black Ops, a stout aged in bourbon barrels and then refermented in the bottle with champagne yeast. It was dubbed Black Ops because it was brewed in secret, it existence known to only 5 people at the brewery, and given away as gifts to employees for the holidays; that way no one could complain about the subterfuge. It clocks in at 11.6% abv, and its chocolate and coffe notes were excellent foils for the venison. Even the cheese course got votes as favorite of the night. The forsterkase, or lumberjack cheese, is bound in pine bark for aging and captures some evergreen aromas, as well as a fine crystaline, sapps, crunch residue on the rind. Funky and delicious. Even the simple roasted dates were sublime. The Detonation Ale is the Blast! IPA's big brother. Not only is it brewed using seven varieties of hops, a nearly all American line up with the exception of the lone East Kent Golding from UK, which they refer to in this beer as ‘The English Aristocrat’, but it also is a hefty 10.2 % abv. Boom! For the final beer, we got Cuvée de la Crochet Rouge, which is the most rare beer they make, having produced only a single barrel. This beer is another version of Local 1, aged in the barrel for 7 months on botrytized Riesling lees (leftover grape skins after wine making). Botrytis is a fungus that under certain conditions infects grapes (or other fruits) on the vine, but in wine making it is prized for making possible certain desert wines, eg Sauternes. The fungus plays a similar role as freezing grape in the production of ice wine, ie it draws out moisture from the grapes and concentrates the remaining sugars and other compounds in the shriveled grape, allowing intense and sweet wines to be produced. This was the one pairing that didn't quite work for me, however both the beer and the tart were excellent on their own. So I simply enjoyed the dessert, and then savored the beer separately. The beer was delicious, although I would be hard pressed to identify it as beer and not a wine, so profound were the effect of the lees on the beer. It retained very little carbonation, and the Botrytis imbued the beer with complexity and many flavors not normally found in beer. Excellent indeed. Colicchio&Sons plan to do similar Brewmaster dinners monthly, the next one is Feb 20th with Ommegang. I'd be there,but I'll be in Vegas. Hopefully I can make March's. Brooklyn Brewery does similar events fairly often, consult their events page for details. Here is another review of our dinner, from a blogger who didn't pocrastinate quite as long as I did on the post.